Henry Oscar Houghton, a one-time mayor and long-time resident of Cambridge, Massachusetts, founded Riverside Press in 1852. The company emerged largely as a result of Houghton’s bold decision to enter into a financially precarious partnership with the printing company Freeman & Bolles in the 1840s. Upon becoming the sole proprietor of this company, Houghton’s primary client – Little, Brown, and Company – purchased, renovated, and leased to Houghton the Cambridge Alms House Estate to use as a printing press. Given the location of the building, which was situated alongside the Charles River, Houghton named the press Riverside and included it as a division of his new firm H. O. Houghton & Company. Soon after its establishment, Riverside attracted several significant publishing firms and established publishing contracts with Atlantic Monthly and G. & C. Merriam Company, among others. In 1867, Houghton not only was able to purchase the Riverside property from Little, Brown, and Company, but also was positioned to initiate plans to build an additional four-story structure, doubling the current productive capacity of the press (Rheault, 1979). By 1872, Houghton admitted George Mifflin to the partnership and renamed the firm Houghton, Mifflin, & Company. Riverside continued to expand throughout the latter half of the nineteenth century, growing from a mere 90 employees at the time of its establishment, to over 600 employees by 1886. Increasingly, Riverside became known on account of the typographic, stylistic, and artistic components of its work; in fact, from 1880 on, the press used the motto “Tout bien ou rien” – do it well or not at all – as part of its colophon. After Houghton’s death in 1895, Mifflin capitalized on Riverside’s reputation for quality production by releasing several elaborate editions of classic literary works. All but one of the thirteen published titles completely sold out and many second-hand copies of these Riverside Press Editions actually went for more than half their original price. Beyond this specialized production, regular production at Riverside also expanded throughout the late eighteenth century and into the nineteenth century. Not only did the number of steel presses increase from 33 in 1889 to 60 in 1905, but also two new buildings were added to increase the productive capacity of the plant (Rheault, 1979). While Riverside functioned throughout the First World War, it was ultimately forced to deal with many of the economic tribulations -- including inflation, wage reduction, and depression – that were impacting the country as a whole. These problems eventually resulted in a workers strike at Riverside on April 4, 1921. This dispute coincided with the death of George Mifflin and had significant impacts on the composition of the company’s workforce. With the onset of World War II, production once again increased at Riverside, largely on account of government publications and wartime reading. 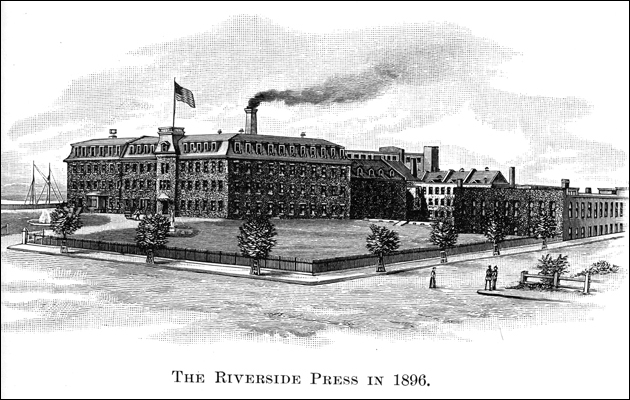 While Riverside had to contend with paper rationing and the loss of employees to the war effort, the press continued to purchase new machinery and to build new additions (including a bindery) to the plant throughout this period. By 1946, Riverside had expanded to the point that it occupied all vacant surrounding property and the purchase of offsite warehousing became necessary. Over the next several decades, Houghton Mifflin – Riverside’s parent company – invested over 3 million dollars into the ongoing advancement and development of the press. By the late 1960s, however, with the advent of newer technology and increased competition, the viability of Riverside began to be called into question (Rheault, 1979). By 1971, the original Riverside Press was closed after 120 years of continuous operation in Cambridge. The press name and the equipment were sold to Rand, McNally, & Co. and operations were relocated to Michigan (Cambridge Historical Commission, 1971, pg. 117).